What to look for when shopping for the perfect spring off-the-shoulder (OTS) top? Follow these 7 tips & shop the links below. You've probably seen all these beautiful off-the-shoulder blouses everywhere from Instagram to Pinterest. These OTSs are the IT GIRL top for this S/S season. I've been through (and still going through) my off-the-shoulder-obsession phase and from purchasing various types of OTS, I've learned what to look for and what to avoid when buying one of these beauties. 1.) If you are not a big fan of prints or texture (i.e. gingham) go for solid. Make sure you buy an OTS with a solid color but with details on the shoulder lining and/ or sleeves (see here & here). Detailed sleeves are a great way to pop your OTS blouse without being too over-the-top or busy. 2.) If you're looking for comfort (any movement), stretchy is your BFF. Make sure you look for OTS that has stretchy shoulder lining (see here & here). There's nothing more uncomfortable than having an OTS top where you can't lift your arms to eat, stretch or to just even give someone a hug. I've had my fair share of an unstretchable OTS top, and it really limits your movement since the limited stretch band on the shoulder linings inhibits your horizontal arm movements. 3.) If you don't trust your blouse to stay up and feel insecure, go for OTS with neck/ shoulder strap(s). I totally get it, no sleeves, no ease. But this doesn't mean that you can't join the fun! Instead, you should opt for one of these (see here & here) OTS blouses where you have a secure fabric around your neck and/or shoulders while still exposing your beautiful shoulders! This one is great because a.) it's affordable b.) there's literally no way for your top to fall because even the neck and/or shoulders are fully wrapped around you. 4.) If you're looking to buy more than one, definitely buy one solid color and one with print mix, so you can mix up your OTS looks (see here & here). 5.) 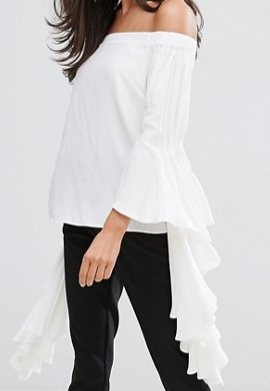 Let's talk balance here: if you're buying an OTS with large flares and wavy fabric on the bottom, then opt for a minimal design on top of the blouse. When executed wrong, it can look rather unflattering, and it's spring / summer, so show off your beautiful bod and embrace and accentuate them rather than hiding it in a ton of fluff (see here & here). 6.) Vice Versa: if you're buying an OTS with large flares and wavy fabric on the top, then opt for a minimal and straight-line blouse on the bottom (see here & here). 7.) Wear your blouse with Confidence. There's no better accessory than making sure you feel good and proud in what you wear. And yes, this makes a difference to your OOTD. SEE MUST-HAVES OF THE SEASON! FOLLOW MY INSTA JOURNEY HERE! SHOP MY STYLE AND MORE HERE!